Higgins Aggregates - Meremere quarry located near Te Kauwhata in Waikato was awarded the 2014 Mimico Environmental Excellence Award from the Aggregate and Quarry Association. The Award was for the construction of a wetlands area on land opposite their quarry. 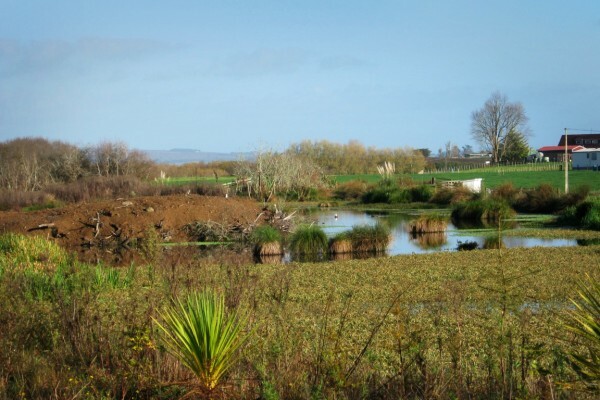 The project was driven to mitigate the effects from any run off to the stream which drains the large catchment area of the farm surrounding the quarry, through the operational quarry area and then exits through adjacent farm land and finally into the Whangamarino Heritage Wetland. An island was created as a centre piece of the wetland. This island solved several challenges and provided an ideal viewing area that overlooks the entire project; assists to create a larger pond network and longer water flow path which allows filtration of any microscopic fines to be achieved. To date 8000 native plants have been planted. The creation of the wetland has allowed for the clearing of the willows in this area which has enabled unrestricted access for ducks, swans, fish, frogs and birds which can now be observed breeding in the wetland.